I’ve been sharing our story of taking Felix to Los Angeles to receive gene therapy, an experimental therapy for SCID-ADA. I explain gene therapy here. The first three days can be found here. When I left off, Felix had just received his dose of chemo (busulfan), and was just recovering from the pain of the bone marrow harvest. Felix was doing much better by this day. His throat was much better, and he ate well — almost back to normal. 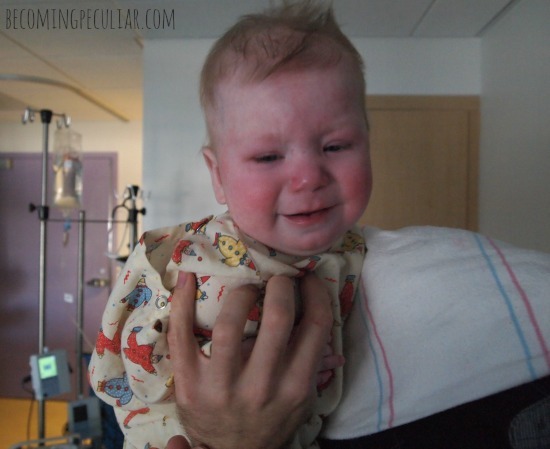 We didn’t notice any adverse affects from the chemo or from his refusal to eat for thirty hours. What a relief! The only real cause of discomfort at this point was from the morphine they’d given him the night before to manage the pain. I hadn’t known this, but a common side effect of opiates is itchy skin, especially on the face. Felix was SO ITCHY. He kept rubbing and scratching his face until it was puffy and covered in angry red scratches. We clipped his fingernails but most of the damage was already done. By evening the itching had mostly resolved itself and he was back to his old self. His scratches scabbed over and just needed some time to heal. Ben and I decided at this point to check out of our hotel. It was too far away and too expensive. It was frustrating having our stuff divided in two different locations and just not worth the money. By checking out early we saved ourselves almost $600. On the plus side, we felt free to indulge in the nicest, fanciest food we wanted. On the negative side, we had to take turns sleeping on the couch and the chair in his room. The chair was awful but the couch felt like LUX-U-RY in comparison. Among the transplant community, Transplant Day is often referred to as the patient’s “Life Day.” I woke up with tingling with excitement. Felix’s Life Day had finally arrived!! A part of me had doubted we would ever make it here. It felt surreal. 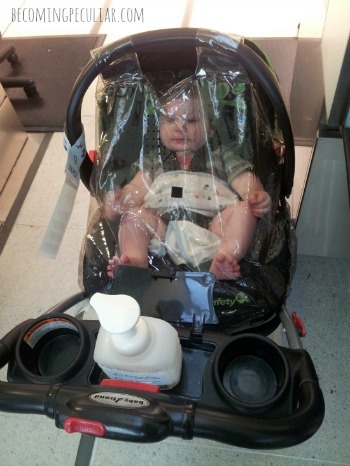 Here we were in Los Angeles, ready to get our baby genetically modified, praying that it would save his life. Everything went perfectly smoothly. Around 3pm, all of the doctors who had been involved in the bone marrow harvest and modification came into the room, along with two nurses. Out came the syringe with his new, modified cells. 135 million of them. See that bigger syringe with the cloudy-white substance? Those are his modified stem cells. And that was it. We thanked everyone and they left the room. Felix was finally allowed to go to sleep. 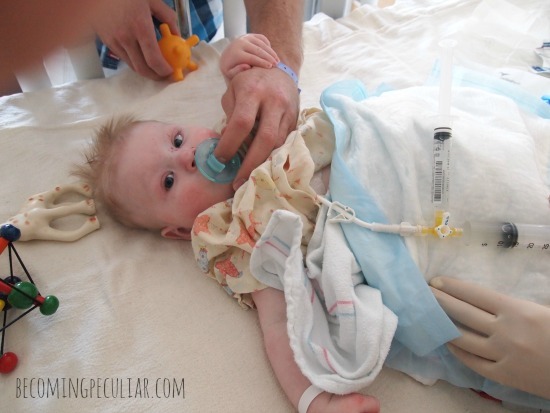 The nurses continued to check his vitals frequently over the next few hours, though they weren’t expecting any adverse reactions — they’re his own cells, after all. Ben and I took turns getting out of the room. 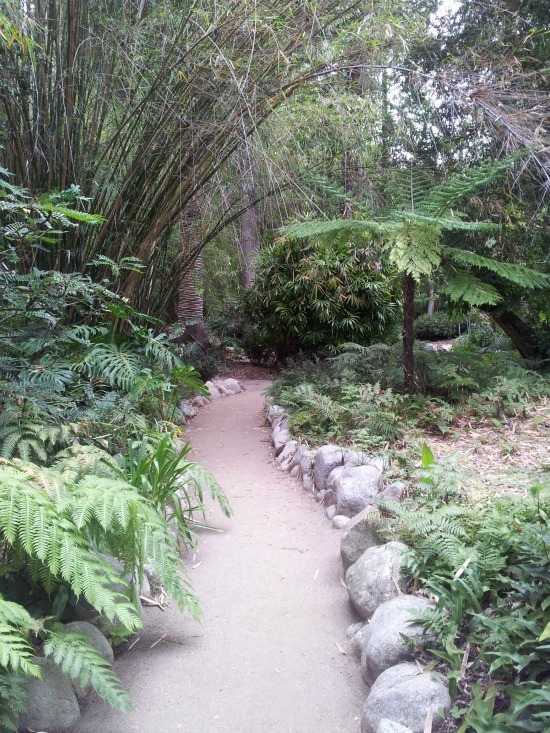 I walked down to the UCLA Botanical Garden and wandered through the gorgeous, winding paths. The next two days we had to stay at the hospital just so the team could keep an eye on Felix. There wasn’t much fear of anything going wrong, but they just wanted to be sure. 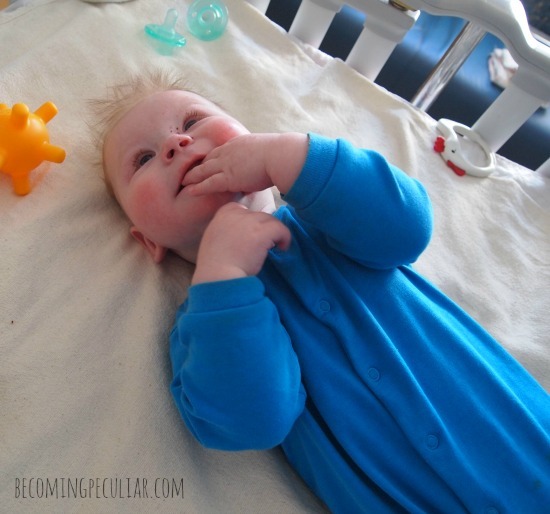 But Felix had another thing going on: teething! At seven months old, he finally cut his first tooth! He was pretty grumpy, and did a lot of whining and drooling and chomping; but as soon as that sharp little point made its way out, he was much happier. How funny that he happened to get his first tooth while in LA. Otherwise, the next two days were uneventful. (That’s just how we like things in the hospital!! Boring = good!) We mostly hung out in his room; I took a walk downtown to visit Whole Foods (my favourite store — we don’t have any where we live); and I got a visit from a dear online friend. It was such a treat to get to talk face-to-face and have her speak wisdom into my life. Also: she gave me gifts! Also, I just want to take a moment to note what a fantastic hospital this is. The building is beautiful and huge. The cafeteria is AMAZING. The food is delicious, fresh, and healthy. And inexpensive! The selection is enormous. Every morning I got a made-to-order omelet with fresh vegetables for the price of an Egg McMuffin combo. 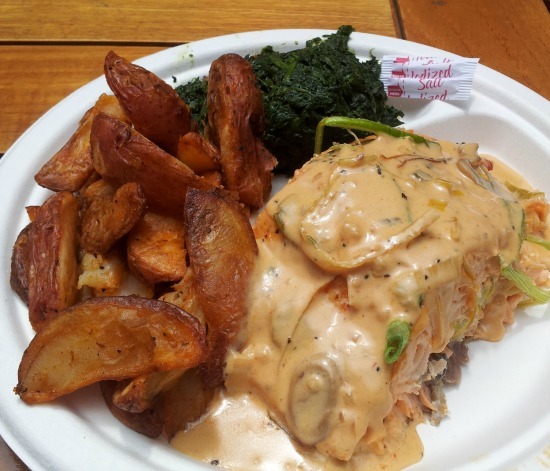 For lunch today I had roasted salmon with leek and mushroom sauce, with a side of roasted potatoes and steamed spinach. For seven bucks. I enjoyed it out in the sunny dining garden. Amazing!! On Sunday we were discharged. We packed up and caught our ride to the airport. The staff was super-helpful getting us through without too much exposure to the crowds. 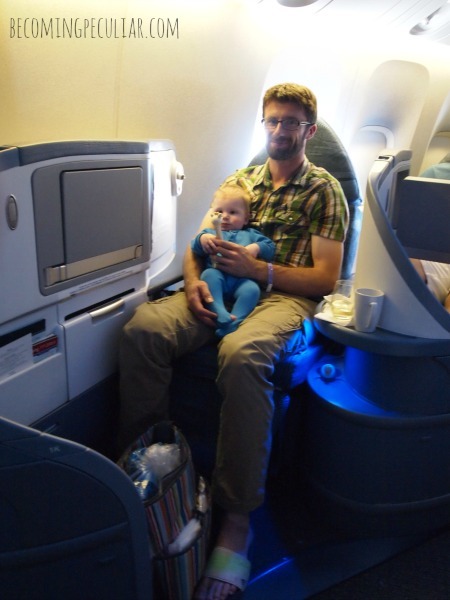 Again, our first-class flight with Air Canada was absolutely wonderful. I got to take a much-needed nap; Felix did great during takeoff and descent. We spent another night in a hotel in Toronto, and then drove ourselves to London Victoria Hospital where we’ll be spending the next month. 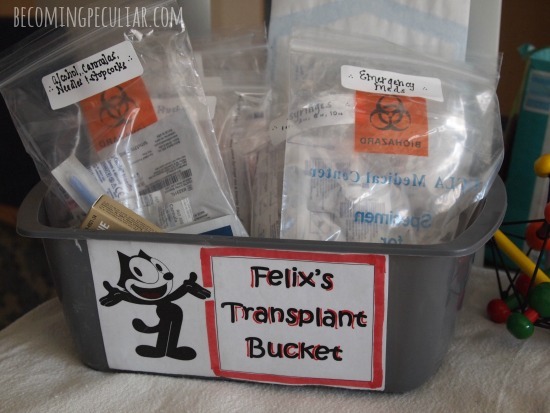 Felix will continue to be closely monitored over the next weeks as his white cell counts drop from the chemo. Hopefully we will see them begin to come up, at which point we can go home. 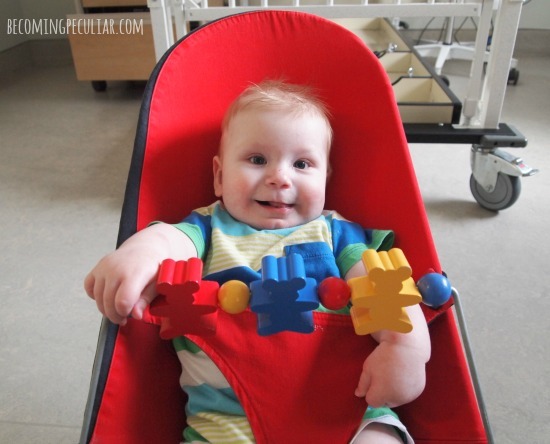 He will continue to be closely followed over the next six months or so as his immune system (hopefully!) reconstitutes itself, thanks to his newly-corrected bone marrow stem cells. 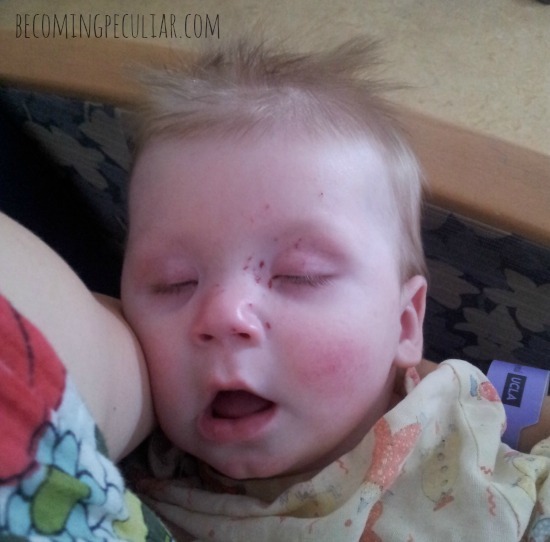 As I’ve mentioned, our biggest area of concern now is his CMV — the virus he acquired in his first weeks of life. As his white blood cells drop, he will have less defense against the virus, and it may rise again and could threaten his life again. The most crucial period will be three or four months from now. Please continue to pray that his immune system recovers quickly and strongly enough to combat the CMV. Thanks again, from the bottom of our hearts, for all the love and support. We couldn’t have done this without you. Heather recently posted..Happy Eight Months Birthday, Cody! Wow, Heather — thanks so much! I’ve been following along since you got Felix’s diagnosis and this is SO exciting!!! I pray he continues to improve and the CMV isn’t a problem. This is so great! Also…”What a weird life.” so true! You and your family are in my prayer journal and once you’re in, you don’t come out. Praying particularly for beautiful Felix…looking at him, I wouldn’t guess that he is anything other than perfectly healthy. He looks fantastic. Thanks for your faithful updating via this blog. 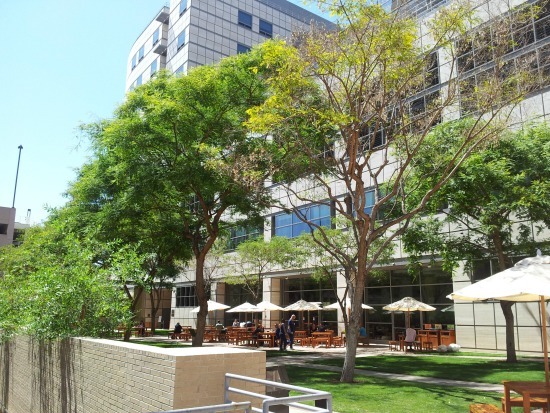 Hours and days and weeks are passing….you will get beyond this stage and be able to reenter your “normal” life; I know how wearying hospital watches are, but time will take care of a lot of this trial. I absolutely love your updates. I look forward to each and every one. “What a weird life” made me giggle. The picture of Ben and Felix on the plane is precious. Just precious. What a proud papa.